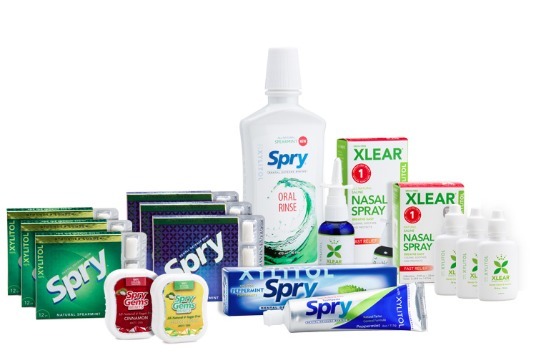 Xlear Inc. is considered one of the leading manufacturers of xylitol-based products in North America. They are committed to "providing consumers with the health benefits of natural sweeteners, such as xylitol and erythritol, by manufacturing natural, health-enhancing products based on these incredible sweeteners found in wood, fruits, vegetables, and other natural sources." 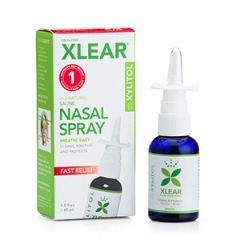 Founded in 2000, Xlear got its start with its first product, Xlear Sinus Care Nasal Spray. Dr. Alonzo H. Jones, D.O., who was a family physician in Texas who wanted to find a solution for patients with upper respiratory issues. His research led him to xylitol and Xlear was born. ​So what is this xylitol anyways? "​Pure xylitol is a white crystalline substance that looks and tastes like sugar. It’s not an artificial sweetener, but an all-natural sugar alcohol found in many fruits and vegetables and produced in small amounts by the human body. Xylitol has been researched for over 40 years, resulting in thousands of studies confirming its effectiveness and safety." It was discovered in the late 19th century and has been used for years as a sweetener in Russia and an additive to solutions used for intravenous feeding in Germany. It wasn't until the 1970's that the dental benefits of xylitol were discovered by a research team in Finland. 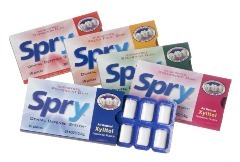 According to their website, "Spry Gum is sweetened with xylitol only. Frequently eating foods high in sugars and starches can promote tooth decay. Xylitol, unlike other sugars, may reduce the risk of tooth decay." Xylitol can help reduce the risk of tooth decay and with five different flavors to choose from, you are sure to find a gum to help your dental defense. Studies have shown that bacteria simply cannot stick to teeth in a xylitol-rich environment. Personally, I am not a fan of shell gum, so I let my go-to taste tester husband give them a try. The shell is not as hard as other gum brands, but the flavor was strong and lasted longer than other gums he has tried. Joe enjoyed the gum so much, he ate nearly the entire pack. Spry Dental Defense xylitol toothpaste comes in four flavors, 2 are fluoride-free and 2 have fluoride. 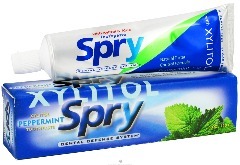 "Spry toothpaste is rich in xylitol (at least 25% of the total weight), a great tasting natural sweetener that promotes oral health. With our toothpaste you will enjoy a healthier smile, fresher breath, and a cleaner mouth. Clinical studies have shown xylitol to have excellent oral health benefits." I have to say, this was one of my favorite products that I got to try. I loved the Cinnamon Fluoride-Free toothpaste and it left my mouth feeling fresh and clean after every use. This will definitely help me win the fight against those cavities! Spry Dental Defense Oral Rinse is "cool and refreshing with all-natural xylitol, a great-tasting natural sweetener with unique dental benefits. It is quick and easy to use! A 60-second rinse with Spry Oral Rinse reaches parts of the mouth that may be missed by brushing alone. When used daily, this mouth wash helps wash away bacteria and keeps your mouth clean and leaves you with great tasting breath." I sampled the mint flavor and unfortunately, mint is just not my flavor. I think I am more sensitive than others, but this oral rinse kind of burned my mouth (just like other mouthwashes I've used). Xlear suggests that you use it twice a day for 60-seconds. I last for about 20 seconds. Spry Gem Mints come in five different flavors that are surprisingly refreshing. We sampled the Lemon Cream flavor and it left my breath feeling fresh. There was no bitter after taste, just a cool refreshing feeling. Xlear recommends a mint after every snack or meal to help fight against bacteria that could cause tooth decay. I was pleasantly surprised on how much I enjoyed these (after-all Like I've said before I'm not a mint person). The product that started a company. Xlear's Saline Nasal Spray is a combination of saline and xylitol that leaves your sinuses feeling moisturized. "The patented solution is all-natural and contains xylitol, purified water, salt, and grapefruit seed extract. Our xylitol and saline solution is hyper-osmotic, which draws moisture and keeps the nasal passages and sinuses more moist and clean than saline alone. The addition of xylitol helps to ensure that beyond just cleansing, our nasal spray is also moisturizing and protective to the delicate tissues." Joe gave this a try at the end of allergy season, and noticed some relief, however, we will have to wait until next allergy season to give this a full try, so stay tuned! Visit the Xlear Website and use the coupon code Save50 to purchase your Xlear Care Kit which includes samples of each of the items above valued at $65, for only $25. 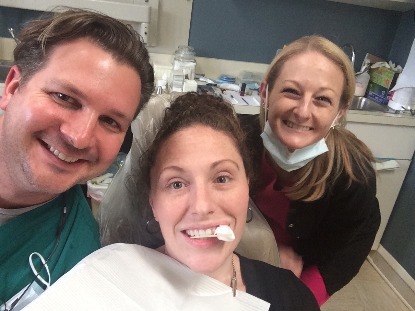 A few weeks ago, on a routine trip to the dentist to get my teeth cleaned, it was discovered that I may have six cavities, one of which may require a root canal and crown...yikes! After three different dental appointments, I finally found out that four of the cavities could be potentially repairing themselves. I was a soda drinker for years, but in the past couple of years, I have cut down my soda consumption dramatically. Literally, I have gone from 3 to 4 a day, to maybe 1 every other week. At my last dental appointment, my dentist told me that my cavities could actually repair themselves. This gave me hope and ignited my passion for Xlear products because I want products that will naturally heal my teeth. Thanks to the Xlear line of products, you can show off your healthy smile all while you still enjoy the foods you love because where there's a meal, there's a way!